This game has unused text. This page is rather stubbly and could use some expansion. Are you a bad enough dude to rescue this article? This page or section needs more images. There's a whole lotta words here, but not enough pictures. Please fix this. Hello, and again, welcome to the TCRF wiki article pertaining to unused assets within the computer entertainment software known as "Portal". We hope your brief detention in the relaxation vault has been a pleasant one. Your specimen has been processed and we are now ready to begin the article proper. Before we start, however, keep in mind that although fun and learning are the primary goals of TCRF activities, serious injuries may occur. There's more stuff on various Wikis: Valve Developer Community, The Portal Wiki, and maybe the Combine OverWiki or Half-Life Wiki. There's a source code leak, which may or may not be of a prototype. Revisional differences (first version: Windows Orange Box; last version: latest Steam update (Win, Mac, or Linux) or Android port. Present in materials/models/flag is the Team Fortress 2 BLU briefcase texture, apparently misplaced here. The early fixed portal border texture, seen in many pre-release screenshots, remains in the game files in the portal/materials/signage/ directory. A red-colored portal, present in portal/materials/models/portals/portal-red-color.vtf. This is the color the orange portal had during development, and if you turn on the closed captions the message "Red Portal Open" will appear whenever you shoot an orange one. This misnaming is present in all languages. To enable it in-game (replacing the orange portal), modify portal/materials/models/portals/portalstaticoverlay_2.vmt to read "$PortalColorTexture" "models/portals/portal-red-color" instead of "$PortalColorTexture" "models/portals/portal-orange-color", although the particles around the portal will stay orange. This odd texture is present in portal/materials/models/props_facemovie/wet_floor_sign, without a matching model in the game files. 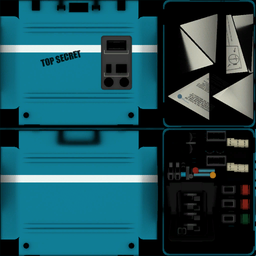 Files used in the "props_facemovie" folder were originally intended to feature in a Source Filmmaker video, and a matching model for the sign can be found in the Source Filmmaker files, albeit with a plain texture. 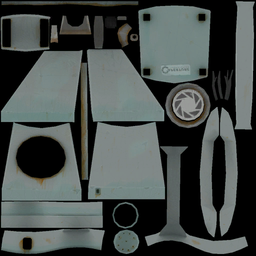 There is an unused skingroup texture of Aperture Science's emergency phone prop, colored white. Present in the portal/materials/models/weapons/v_models/v_portalgun/ directory is a texture for a much earlier Portal Gun, as seen in this video. A couple of concrete and plastic textures that never got used. 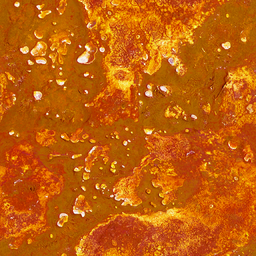 This texture, in portal/materials/nature, apparently would have appeared as the surface of toxic slime as seen from below. The material simply reuses the top texture for both sides. A few overlays, a poster and a couple of oil stains, also never got used. stain_oil_06.vtf lacks an alpha channel. An odd skybox made up of orange and white boxes. There's more unused audio for GLaDOS than just this one, extract them and upload them here. Present as portal/sound/vo/aperture_ai/file_deleted.wav. It is simply GLaDOS saying "File Deleted". Unused line for when the player is spotted by a Turret. Unused line for when a Turret is searching for the player. Unused line for when a Turret is shooting at the player. Unused lines for when the player knocks down a Turret. Unused lines for when the player picks up a Turret. Only portalgun_rotate1.wav is used as the podium for the Portal Gun never makes a turn of more than 90° at any given time, even when the Portal Gun faces something that cannot have a portal placed on it, like an invalid surface, the podium stops anyway. Unused ticking sound for a clock. Present in the game's particle files are a different particle system for portals that was never used in-game. It can be enabled by running the game with the -tools argument. 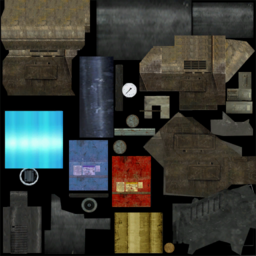 The prefabs included in the Source SDK Episode One tools with the folder "prefabs" (having three folders inside, one which is for Portal) feature old versions of map elements in Half-Life 2 style. 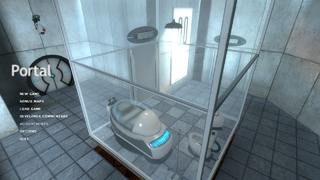 Portal used Half-Life 2 assets in the early stages of development as placeholders. In the actual Portal Gun's viewmodel, there's a non-animated hand without textures. Unfortunately, Chell's hand texture's UV mapping does not match the VTF meaning the texture does not align with her arm. If you noclip to the end sequence, you will find a radio NPC named Tim Larkin. Larkin created the ending cinematic music/sound, and this NPC controls the playing of those sounds. It was named after him in his honor. A few unused subtitles can be found in the closed captions files. They are translated into different languages. The scripts/npc_sounds_aperture_ai.txt labels them as BONUS REWARD SOUNDS, and reveals they were to be spoken by GLaDOS. The matching audio files do not exist. "portal.bonus04_2"   "<clr:219,112,147><I>[Warping Effects] Fling! Fling! Fling! Fling! Fling!" "portal.bonus02_2"   "<clr:219,112,147><I>Before, when I told you it was your last chance, that wasn't completely true. This is your real last chance. Now, STOP what you're doing!" "portal.bonus05_2"   "<clr:219,112,147><I>Enrichment Center regulations require both hands to be empty before any cake can be served." "portal.bonus04_1"   "<clr:219,112,147><I>Get ready to fling yourself. Fling into space." "portal.bonus01_3"   "<clr:219,112,147><I>I know you don't believe this, but everything that has happened so far was for your benefit." "portal.bonus06_3"   "<clr:219,112,147><I>I'm checking some blue prints and I think... yes, right here! You're definitely going the WRONG way!" "portal.bonus05_3"   "<clr:219,112,147><I>Look, we're both stuck in this place. I'll use lasers to inscribe a line down the center of the facility, and one half will be where you live and I'll live in the other half." "portal.bonus03_2"   "<clr:219,112,147><I>Most importantly under no circumstances should you remove the device from the testing area." "portal.bonus01_2"   "<clr:219,112,147><I>There really was a cake." "portal.bonus03_1"   "<clr:219,112,147><I>To reiterate our previous warning, this test requires a mastery of the principles of portal momentum." "portal.bonus02_1"   "<clr:219,112,147><I>Very Impressive! Be warned, however, that complacency can result in failure." "portal.bonus05_1"   "<clr:219,112,147><I>We are pleased with your success." "portal.bonus05_4"   "<clr:219,112,147><I>We won't have to try to kill each other or even talk if we don't feel like it." "portal.bonus01_1"   "<clr:219,112,147><I>Well done. Remember that we are pleased you could join us for testing." "portal.bonus06_1"   "<clr:219,112,147><I>You need to make a LEFT at the next junction." "portal.bonus06_2"   "<clr:219,112,147><I>You need to make a RIGHT at the next junction." This page was last modified on 2 February 2019, at 22:15.